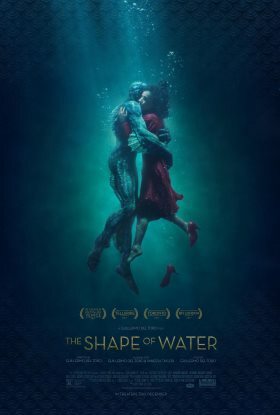 The Shape of Water (trailer) is a 2017 fantasy-drama film from director Guillermo del Toro, based on an idea he'd had since childhood. Essentially he wanted to make a happier version of the 1954 horror film Creature from the Black Lagoon, with the humanoid fish monster and the female lead falling in love. And that's exactly what happens in The Shape of Water! It takes place in 1962, starring a mute woman named Elisa who's part of the cleaning staff at an American government research facility. In one of the labs, she learns of "the asset", an intelligent humanoid amphibian creature who's being tortured. Falling in love with him, she wants to set him free with the help of a small group of collaborators.